When a bridge was washed out in Siberia there was only one way to get people across. The water was moving too fast for people to use small boats, so another way had to be devised. So what did they turn to? You already know, because you read the article title—excavators. 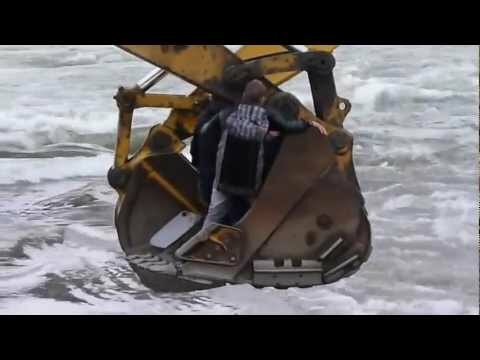 An excavator on each side of the river was used to transport people across the rapids by having them ride inside the buckets. It gets a little tricky and scary when the people have to switch from one bucket to another while being suspended over the raging water. We don't know the full story, but I imagine that the one side of the river was in danger of being flooded, which could explain why there was a line of people ready to take the risk to get across.